7. 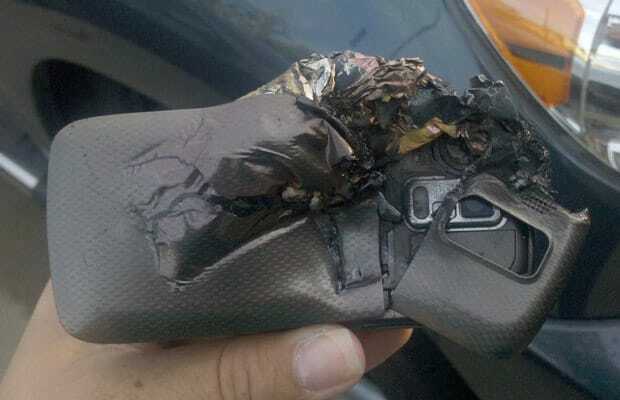 "A Cellphone Exploded In My Face"
Gizmodo reader Corey shared a scary tale with the tech site about his Verizon Samsung Rogue handset detonating in his face. He mentions rinsing “black crumbs and remnants” out of his eye for nearly 20 minutes and experiencing a burning sensation in his peepers. Corey spoke with Big Red about receiving a replacement phone, to which a network representative responded by offering a refurbished model instead, then blessing him with a new one. As for Samsung, well, they never returned Corey’s calls, even after he emailed them images of the defective phone. He should have emailed his medical bills or lawyer’s immediate contact instead.